Sorry I was kind of MIA yesterday. I was working on taxes, and didn't have any stamping time. Today though I'm going to share with you a card based on a make and take we did at Leadership last month. Hard to believe it's been a month since I was in Orlando. Many of you know I'm really not too fond of the big ol' ugly birds as I've come to call them but many people find them quite cute and charming including a friend who's birthday is coming up. This card uses the new So Tweet On Board Chipboard and Good Morning Sunshine DSP. I used a variety of technique to cover the chipboard for this project. The bird body and tail feathers were covered by applying glue stick to the chipboard and covering with DSP and lightly sanding the eges. 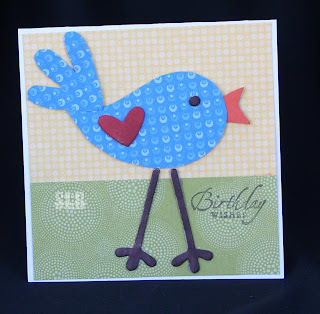 The legs and beak were covered by coloring with a Stampin' Write maker and the heart was covered with craft ink. So, it just goes to show there are a lot of ways to cover our chipboard pieces. I hope to have some new SAB ideas for you tomorrow. Also starting Thursday I'll be posting some projects I did for a Secret Cupid swap I did with some of my online demo friends! That will be fun! We sent three gifts to our cupid and someone sent us three gifts and we unwrap one gift a day beginning on Thursday! Fun, Fun!